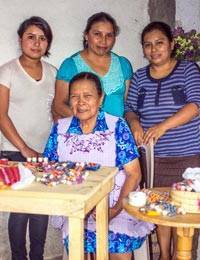 Traditional Guatemalan worry dolls share the love as festive ornaments by the Lopez Garcia Family. Each doll in the set of six is crafted by hand and wears a handwoven skirt and headdress. 'The idea is to trust each doll with whatever troubles you. It is said that during the night, while we sleep, the dolls will whisper the solution to our troubles,' says Ana from the Lopez Garcia Family. The set of six arrives in a hand-loomed cotton pouch.